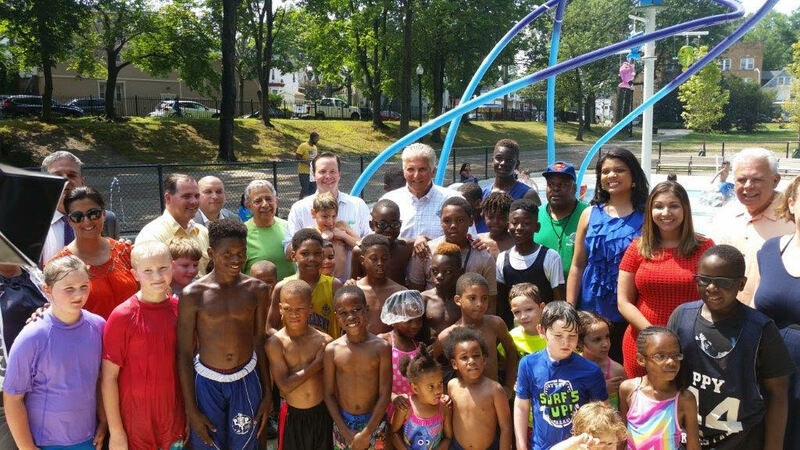 Bloomfield/East Orange, NJ – On Thursday, July 20th, Essex County Executive Joseph N. DiVincenzo, Jr. announced that the expansion to two playgrounds in Essex County Watsessing Park has been completed. Water spray equipment to cool off youngsters when the temperature rises were installed near Dodd Street and a cargo net climber and other new equipment have been installed at the play area near Prospect Street. The upgrades are part of the County Executive’s ongoing initiative to provide modern facilities to meet the needs of the community. “We are always looking for new ways to make our playgrounds more attractive and meet the needs of the community. The water spray equipment and climbing apparatus expand the recreation opportunities at both playgrounds, enhance the excitement children will have when they come to the park and provide a unique feature where they can cool off on hot days,” DiVincenzo said. An approximately 3,000-square-foot addition has been constructed at the playground located on Glenwood Avenue near Dodd Street in East Orange. There is a variety of water spray equipment that can be enjoyed by children of all ages. A shade structure with Adirondack chairs enables parents and guardians to comfortably watch their children at play. A drainage system, water fountains, a bicycle rack, benches and trash receptacles also were installed, trees were trimmed and landscaping was enhanced. It is anticipated that the spray park will be open between Memorial Day and Labor Day, seven days a week from 11 a.m. to 7 p.m. It will close in the event of inclement weather. “This is a positive step forward where on a hot day we don’t have to open fire hydrants and use garden hoses, but instead can bring our children to enjoy this modern spray park. This is an added recreation element that’s available in the park,” Assembly Speaker Emeritus Sheila Oliver said. “This is an amazing day and it’s great to see all the children enjoying themselves,” Freeholder President Britnee Timberlake said. Other elected officials who attended were Freeholders Patricia Sebold and Cynthia Toro, Bloomfield Mayor Michael Venezia, Bloomfield Council members Nicholas Joanow, Carlos Pomares and Ted Gamble, and East Orange Councilwoman Amy Lewis. “We are very grateful to partner with the County. This park gets used a great deal and I can’t think of a better place for the County’s first water feature,” Friends of Watsessing Park President Gouri Sadhwani said. A cargo net climber and other new playground equipment were added to the playground that is located on Glenwood Avenue near the intersection of Prospect Street. The extended play area has a rubberized safety surface and perimeter fencing. Mott MacDonald engineers from Islen was awarded a $55,000 contract to design the Watsessing Park playground improvements. Zenith Construction Services, Inc. from Orange was awarded a publicly bid contract for $931,091 to perform the construction work. The Essex County Department of Public Works monitored the project and answered questions. Funding was provided from the Essex County Capital Budget and with a grant from the Essex County Recreation and Open Space Trust Fund. Work started in March and was completed in just four months. In 2016, the sidewalks along Glenfield Avenue, Dodd Street and Cleveland Terrace were modernized, the basketball court and walking track near Dodd Street were resurfaced, and the pedestrian bridge over the Second River, damaged during a spring storm, was repaired. Also in 2016, the walking track was named in honor of Glen Ridge resident Horace Ashenfelter, the 1952 Olympic Gold Medal winner in the steeplechase who trained in the park. In 2014, ornamental historic lighting was installed along the walking paths throughout the park. In 2010, a synthetic grass surface soccer/lacrosse field in Essex County Watsessing Park off of Bloomfield Avenue was developed, new wrought iron fencing was installed along the perimeter of the park along Bloomfield Avenue and a synthetic grass surface inside the walking track was installed. The park building on Glenwood Avenue was modernized for year-round use in 2008. The walking track, basketball court and lawn bowling building were upgraded, park entranceways were enhanced and landscaping was improved in the southern section of the park in 2006. In 2005, Essex County opened a 19,500-square-foot Off-Leash Dog Facility, the first of its kind in the Essex County Park System. The dog exercise area was created in partnership with the Watsessing Park Conservancy and the federal Environmental Protection Agency. NJ Transit (NJT) also worked cooperatively with Essex County to upgrade the pedestrian bridge in the eastern section of the park. In 2004, Essex County rehabilitated the historic bandstand near Bloomfield Avenue and the Lawn Bowling green off Glenwood Avenue in Bloomfield. The lawn bowling facility was reopened with a new synthetic grass surface and fencing, and repaired restroom facilities in an adjacent field house. In addition, restroom facilities in the Community Center on Conger Street in Bloomfield were updated. Basketball courts located off of Glenwood Avenue in East Orange were renovated and the Essex County seal was painted at the center of each court. Water fountains were repaired, and additional trash receptacles and decorative benches were placed throughout the park. The Essex County Park System was created in 1895 and is the first county park system established in the United States. The Park System consists of more than 6,000 acres and has 23 parks, five reservations, an environmental center, a zoo, ice skating rink, roller skating rink, three public golf courses, golf driving range, three off-leash dog facilities, a castle and the Presby Memorial Iris Gardens. At 69.67 acres, Watsessing Park is the fourth largest park in the Essex System. It was designed in 1899 by the Olmstead Brothers firm and land was acquisition was started in 1901.